As some of our Macs get a bit too slow to use and become completely obsolete, what are we supposed to do with them? Well, here’s a simple way to get rid of your used mac, and make a couple bucks while your at it. 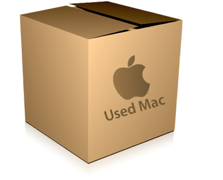 TUAW has posted an excellent article entitled “How to sell a used Mac“, which is definitely worth the read if you are interested in selling your used Mac computer. TUAW also mentions some great sites to visit to gain additional information about your Mac to speed up the process of getting your used computer ready to be sold. Mactracker: is an excellent and free database of specifications of every Mac model manufactured. UsedMac.ca: A great site for researching current used Mac prices and also is a classifieds site where you can list your Mac for sale. Some other sites to check are Macswap.org, Mac of All Trades, Secondhandmac.com and eBay. Readers, please let usÂ know if you have any additional tips or experiences for selling used Macs. I must admit I ran my first Mac totally into the ground so there’s no way I could have sold it. I could probably sell my G4 tower but I use it a bit like a backup server now. I have had some good luck buying and selling used Macs on craigslist.